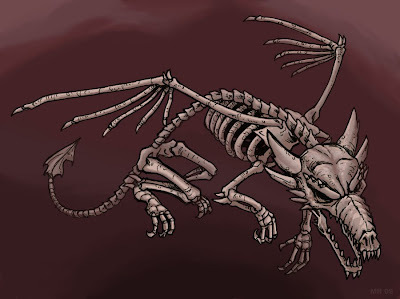 The animated remains of ancient dragons, a Skeletal Dragon retains none of the memories of it's former majestic existence. Although the dragon retains it's large wing structure, it cannot fly due to lack of skin and membrane and thus cannot achieve lift. They they are usually employed by powerful magic users as guardians and such.